WATCH Tragedy at the Elementary School: What Happened in Newtown, Conn.
Lt. Paul Vance said 18 children died in Sandy Hook Elementary School and two more died later in a hospital. Six adults also were slain, bringing the total to 26. Among them was the school's principal, Dawn Hochsprung, multiple sources told ABC News. In addition to the casualties at the school, Lanza's mother, Nancy Lanza, was killed in her home, federal and state sources told ABC News. According to sources, Lanza shot his mother in the face, then left his house armed with at least two semi-automatic handguns, a Glock and a Sig Sauer, and a semi-automatic rifle. He was also wearing a bulletproof vest. Lanza drove to Sandy Hook Elementary School and continued his rampage, killing 26 people, authorities said. He was found dead at the school. It appeared that he died from what was believed to be a self-inflicted gunshot wound. The rifle was found in his car. In the early confusion surrounding the investigation, federal sources initially identified the suspect as Adam's older brother Ryan Lanza, 24. Identification belonging to Ryan Lanza was found at the shooting scene, federal sources told ABC News. Ryan Lanza was being questioned by police. In fact, numerous relatives and friends of the gunman, Adam Lanza, and his mother were being interviewed by the FBI in New Jersey, Connecticut and Massachusetts, all in an effort to put together a better picture of Lanza and any possible explanation for the massacre. First-grade teacher Kaitlin Roig, 29, locked her 14 students in a class bathroom and listened to "tons of shooting" until police came to help. She said that the terrified kids were saying, "I just want Christmas. ... I don't want to die. I just want to have Christmas." A tearful President Obama said Friday that there was "not a parent in America who doesn't feel the overwhelming grief that I do." The president had to pause to compose himself after saying these were "beautiful little kids between the ages of 5 and 10." As he continued with his statement, Obama wiped away tears from each eye. He has ordered flags flown as half staff. The massacre prompted the town of Newtown to lock down all its schools and draw SWAT teams to the school, authorities said. Authorities initially believed that there were two gunmen and were searching cars around the school, but authorities did not appear to be looking for another gunman. It is the second worst mass shooting in U.S. history, exceeded only by the Virginia Tech shooting in 2007 when 32 were killed before the shooter turned the gun on himself. The carnage in Connecticut exceeded the 1999 Columbine High School shooting in which 13 died and 24 were injured. Friday's shooting came three days after masked gunman Jacob Roberts opened fire in a busy Oregon mall, killing two before turning the gun on himself. 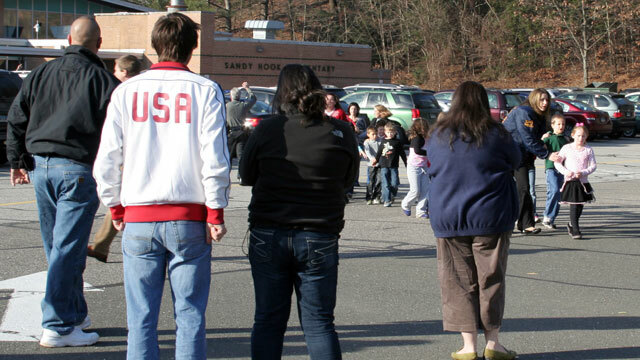 The Connecticut shooting occurred at the Sandy Hook Elementary School, which includes 450 students in grades K-4. The town is located about 12 miles east of Danbury, Conn.
State Police received the first 911 call at 9:41 a.m. and immediately began sending emergency units from the western part of the state. Initial 911 calls said multiple students were trapped in a classroom, possibly with a gunman, according to a Connecticut State Police source. Vance said on-duty and off-duty officers swarmed to the school and quickly checked "every door, every crack, every crevice" in the building looking for the gunman and evacuating children. Soon, state police from across western Connecticut would be there. And they would be joined by FBI SWAT and evidence teams as well as members of the federal Bureau of Alcohol Tobacco and Firearms. A photo from the scene showed a line of distressed children being led out of the school. Three patients were taken to Danbury Hospital, which also went on lockdown, according to the hospital's Facebook page. "Out of abundance of caution and not because of any direct threat Danbury Hospital is under lockdown," the statement said. "This allows us simply to focus on the important work at hand." Newtown Public School District secretary of superintendent Kathy June said in a statement that the district's schools were locked down because of the report of a shooting. "The district is taking preventive measures by putting all schools in lockdown until we ensure the safety of all students and staff," she said. All public and private schools in the town were on lockdown. "We have increased our police presence at all Danbury Public Schools due to the events in Newtown. Pray for the victims," Newtown Mayor Mark Boughton tweeted.